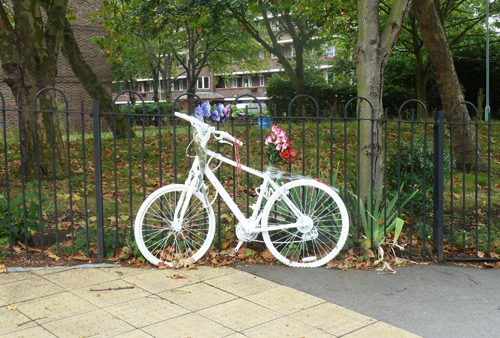 Last week, six months after his death, a 'ghost bike' was placed next to the pedestrian crossing on Deptford Church where Olatunji Johnson Adeyanju was knocked from his bicycle while crossing the road. This coincided with the announcement that the hit-and-run driver has been charged with causing death by dangerous driving and failing to stop at the scene of an accident. The accused man will stand trial at Woolwich Crown Court on October 2nd. Along with the appearance of the ghost bike, some of TJ's friends came to stand vigil, and another tribute to TJ was added to those already left in the comments section of the Crosswhatfields' post written the day after TJ was killed on 23rd March. Also this week, The Times named TJ as one of 88 cyclists killed on Britain's roads so far this year. Update 3/10/2012: Marmoset failed to get any information from the court over the phone so went down to Belmarsh today. The accused, Barry Normah, appeared on 2 October for what was a preliminary hearing. 2 dates were decided: 21 December 2012 for a Police and Case Management Hearing and trial proper on 11 March 2013, both at Belmarsh. More anniversaries! 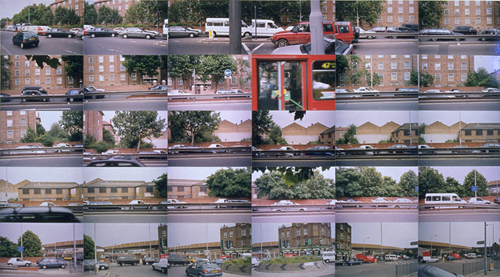 Lewisham Arthouse is celebrating their 20th anniversary with a group show of 48 artists who have been involved with the organisation in the past and present. The exhibition, Rewind!, opens tonight, and continues Wednesday to Sunday (12-6pm) from tomorrow Saturday 28th September till 14th October. 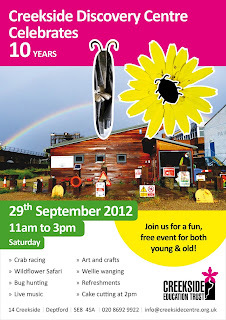 There are also Open Studios next weekend. 140 Lewisham Way (opposite top of Tanner's Hill). Lewisham Arthouse actually moved into the old Deptford Central Library in 1994. 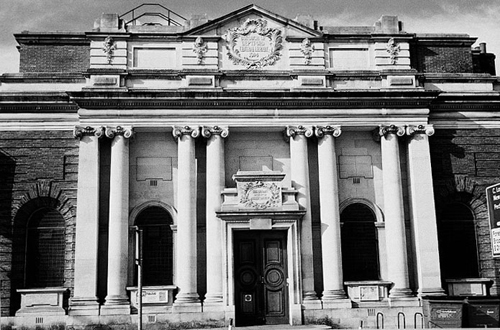 The library (built in 1913) was closed in 1991 and suffered from vandalism until community pressure forced Lewisham Council not to sell it but allow it to remain in community useage. The Arthouse runs courses, workshops, exhibitions and events, and last weekend, the building was part of Open House London. 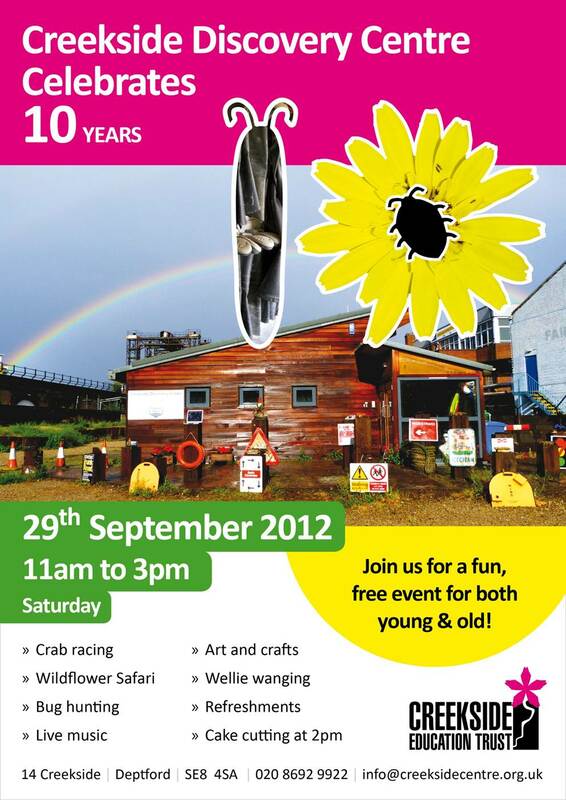 Next Saturday, our local environmental education centre celebrates its tenth birthday. In their search for old photos to help commemorate the occasion, the guys at the centre turned up this photo taken in 1996 before the Creekside Education Centre was built (but whilst it was being conceived). It's the disappeared graffiti from which this blog takes its name. The wall had to go to make way for the wonderful new gates to the centre (designed by local artist Heather Burrell). 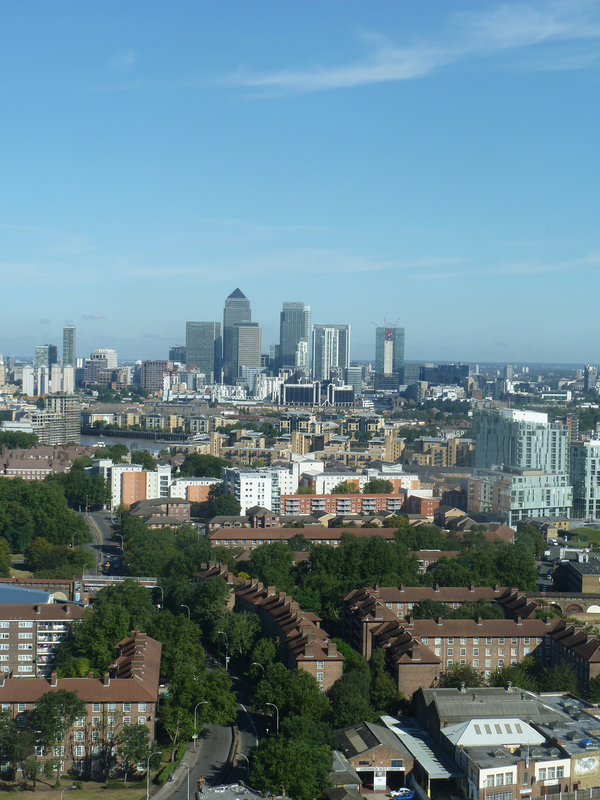 The centre grew out of regeneration funding that came about in the 1990s when the Docklands Light Railway extension was agreed to be implemented. 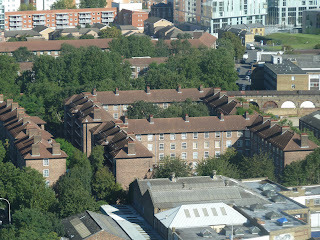 A Creekside Strategy was drawn up in 1993 by Lewisham and Greenwich Councils to identify key objectives to regenerate the area. 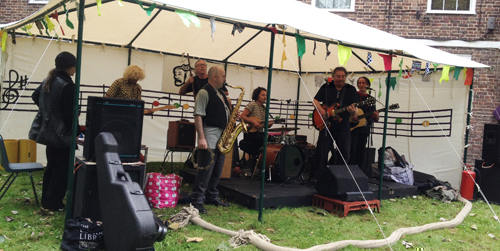 Out of this came the Creek Environment Project in which some specific aims were proposed that enabled Deptford Creek to survive the regeneration process and help prevent over–development. (or before the new Ha'Penny Hatch footbridge was built in 2002). These included the protection and enhancement of the Creek environment, improving public access and understanding, removing rubbish, plus identifying and repairing or renewing flood defences and river walls. From 1996, surveys were commissioned on wildlife habitats, flora and fauna, flood defences, water quality, land use and access, and partnerships were established with local experts, neighbours, government and other agencies. 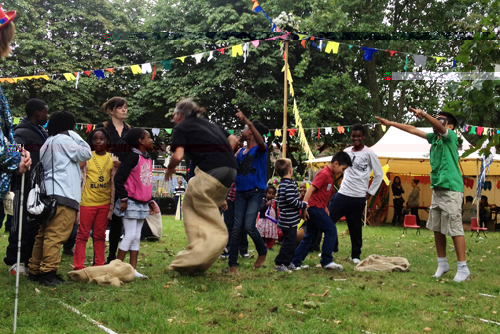 The Creekside Education Trust was founded in 1999 'to work with the local community to sustain the regeneration of Deptford Creek through education, conservation and the forging of partnerships'. 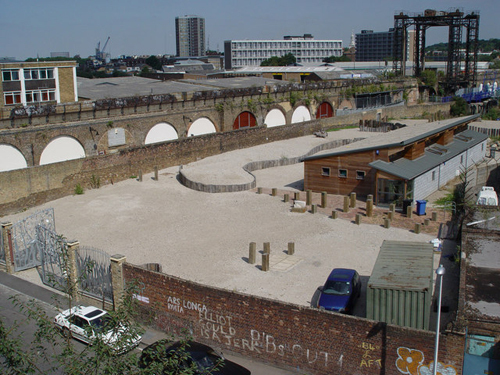 The original idea of having a Floating Education Centre eventually resulted in the development of the disused brownfield site owned by British Gas where there was access to the Creek, and the green roof (or "rubble roof") building which opened in 2003. In the intervening years, the Trust has struggled to survive, and funding for running costs has been difficult to secure, but many of the original objectives have been achieved, such as repairing the river walls, cleaning the river, monitoring the plant and wildlife, and running a schools education programme. Unfortunately they still have to charge the public for their low-tide walks, so many locals have yet to acquaint themselves with the wild river Ravensbourne that is only metres from their doorstep, bu they also run a Volunteer programme – find out more on Saturday. The centre also hopes to launch a new and improved website this weekend. We will be talking to you about two broad options for the running of council housing. The first is for the Council to keep ownership of council homes. 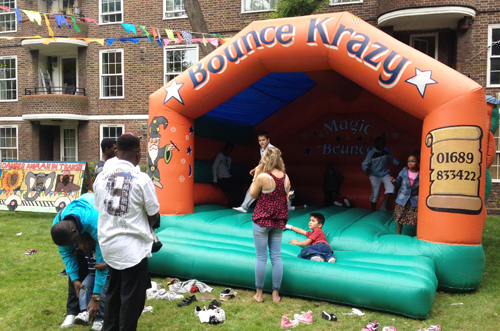 They might be managed by Lewisham Homes, as they are now, or directly by the Council. The second is to transfer ownership of council homes, either to an existing social housing provider (such as a housing association) or to a new mutual organisation in which residents and tenants would have a high degree of control and influence. The last time Lewisham was discussing what to do about housing provision, they offered council tenants the option of transferring to a housing association or remaining with Lewisham under the "Arms Length Management Organisation" (ALMO) Lewisham Homes. 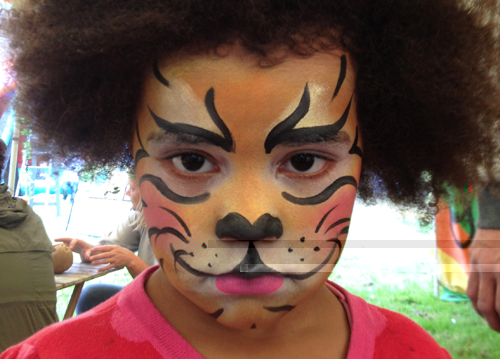 Crossfields chose Lewisham Homes. Even now, Lewisham Homes does not have complete control of the services it is required to provide, some of which remain in the council's control. It's a complicated situation, and the options the Mayor talks about are actually considerably more complicated since there are options within options. For instance, Option 1 is for the Council to retain the ownership of its housing stock, but within that option (Option 1c), they might dissolve Lewisham Homes and bring all its functions back under direct management of the Council. There is also a roadshow event the evening before on Tuesday 25 September, 6.30-9pm in the Civic Suite at Lewisham Town Hall (see here). Someone from the council may also come to explain it all to the Crossfields TRA meeting on Thursday 27 September (7.30-9pm), or in October. You can also download the background papers on the Council's website. Clicking on Housing challenges and opportunities will download "Future of Housing", dated January 2012. There are some interesting statistics in Section 7 and the options are laid out in Section 8. Clicking on Achieving Lewisham's housing objectives will download "Housing Matters", dated July 2012, where the options are discussed in more detail (in Section 9) and this reader lost the will to live. Needless to say, rent increases for tenants (and, no doubt, service charges for leaseholders) are built into all options. 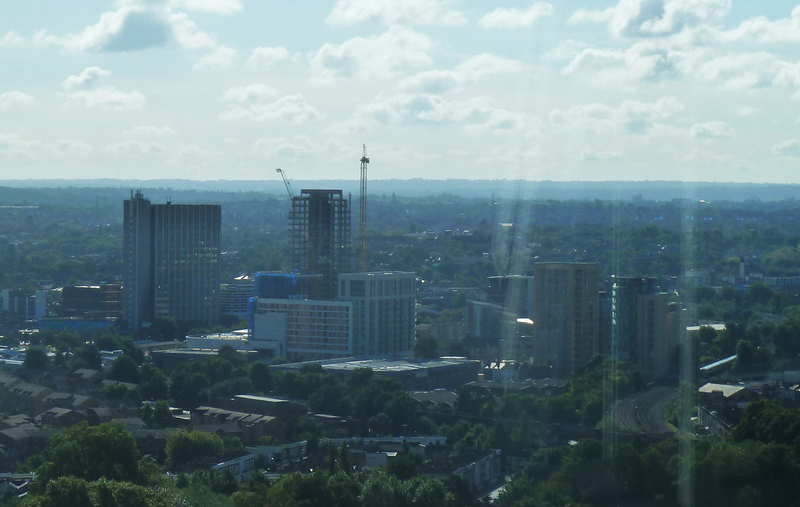 Yesterday, we got a privileged view of Crossfields Estate from the viewing gallery atop the second tallest building in Lewisham, the 27-storey Seager Distillery Tower, thanks to London Open House. Click pics to enlarge. 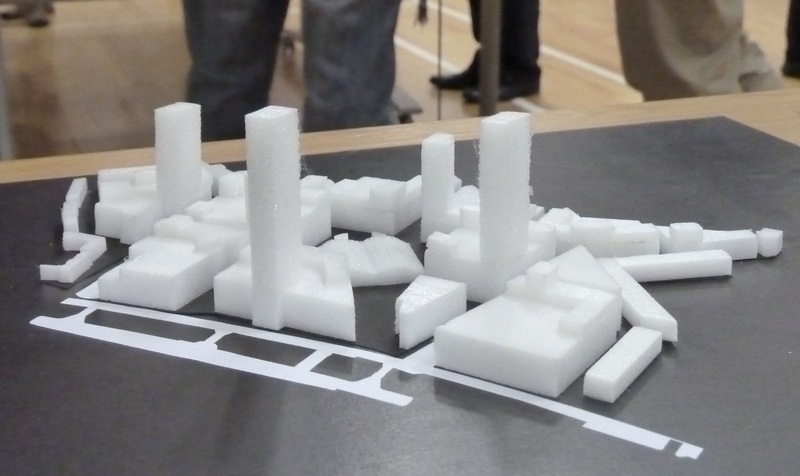 Model of potential 'massing and density' at Convoys Wharf with Olympia building in the middle (July 2012). Another public exhibition was supposed to take place in September 2012. See also the Deptford Dame and Caroline's Miscellany. * See the Deptford Dame's new post on the Paynes & Borthwick Wharf development. After two phases of consultation, Thames Tunnel has put forward Crossfields Open Space as its preferred site to intercept the Deptford Storm Relief tunnel (which runs under Deptford Church Street on its way to the Thames). The use of this site was not even considered in Phase One, but was added to the list after Phase One had recommended Borthwick Wharf Foreshore then found it to be unsuitable. The finalised Thames Tideway Tunnel plans were published in July, with a 12-week period for the public to review the updated construction proposals before they are submitted for Planning Consent. This period, known as "Section 48 publicity" runs till 5 October 2012. 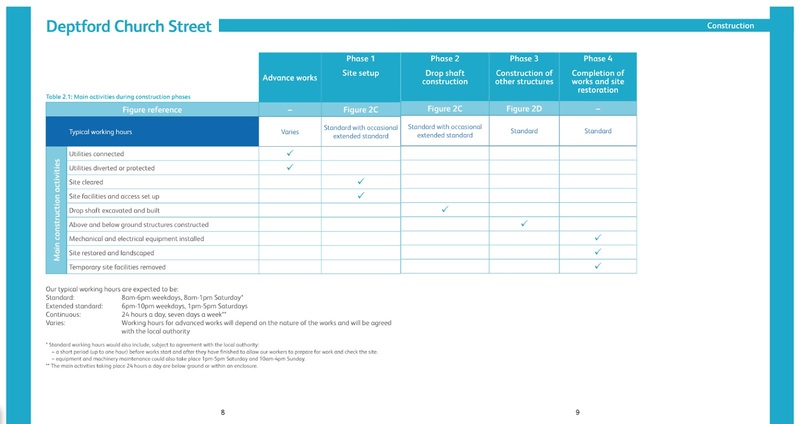 The plans identify 24 preferred construction sites across London and will be 'submitted for scrutiny by the Planning Inspectorate' early next year, a process which may take up till 2015-2016. 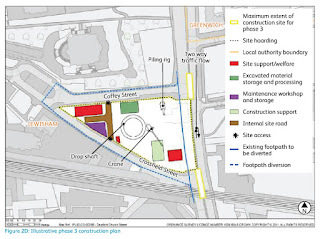 You can read Thames Tunnel's rationale for their decision for the preferred site "Deptford Church Street" or "C32XZ" as they call it (its actual official name is "Crossfields Open Space") in Volume 5 Eastern site appendices, downloadable here. Go to page 83 to read up on Phase One, and page 94 for Phase Two. You'll perhaps notice that the criteria for not doing it in most places apply to the Church Street site as much as anywhere else. They may as well have tossed a coin. You can also view the information specific to the Church Street site here or see below (P2 Deptford CS SIP) embedded in this post. Alarmingly, Thames Tunnel do not make it easy to download this document – you're requested to sign up for a paid subscription account with Scribd.com. There is a 'print' button (but who wants to print 32 pages?) so we have also made a link to the document here in Google docs. 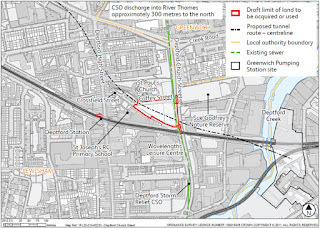 The first map in the document shows the route the interceptor tunnel will take from Greenwich Pumping Station through (or rather, under) Crossfields Estate, intercepting the big storm relief tunnel under Deptford Church Street, on its way to another 'preferred' site, Earl Pumping Station in Rotherhithe. It's a little difficult to assess the information contained in the document – this table, for instance, is spread over two different pages (we've joined them here). There are four main phases, lasting approximately three and a half years. 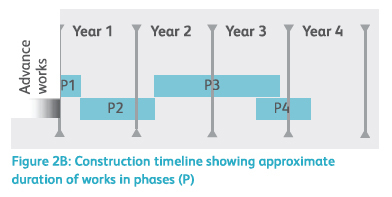 While the connection to the existing sewer in Deptford Church Street (A2209) is constructed (construction phase 3) we would need to close the two northbound lanes, as shown on Figure 2D. 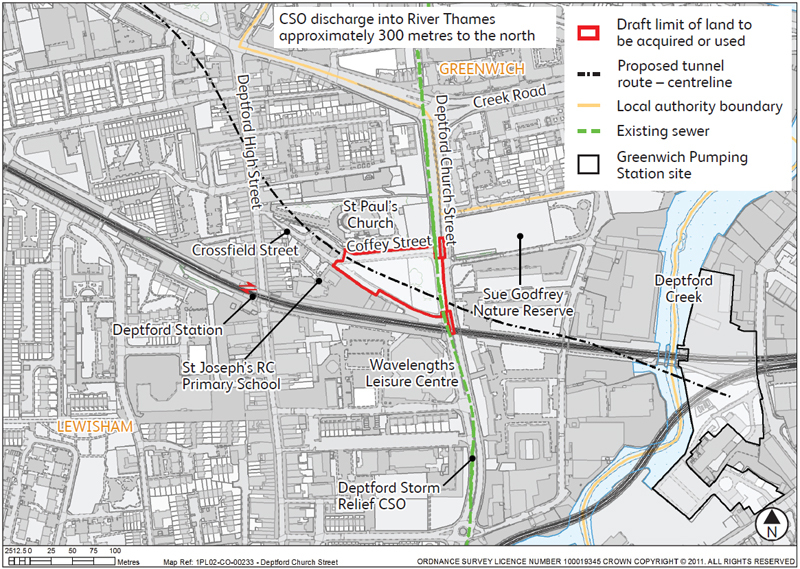 The two southbound lanes would provide two way access along Deptford Church Street (A2209). The bus lane would be suspended to enable this, and buses would need to use the general traffic lanes. The northbound bus stop near Coffey Street and the southbound bus stop near the railway bridge may also need to be moved during this phase and the footpath along the western side of Deptford Church Street (A2209) would be diverted around the site. Based on our current design, we do not anticipate that any junction changes would be required. At the public meeting chaired by Joan Ruddock that took place on 12th September (see Further Reading below), Phil Stride from Thames Tunnel said they had used Transport For London modelling which showed 640 vehicles per hour used the north of Deptford Church Street. Thames Tunnel would only be adding four lorries per hour to this statistic. Someone from the audience immediately pointed out that one side of the dual carriageway would be closed, so Mr Stride's TFL statistics were irrelevant. Their document claims Standard Hours would be kept during Phase 3 – that's 10 hours each weekday (8am-6pm) and 5 hours on Saturdays (8am-1pm). So that'll be 40 lorries a day each weekday then? Perhaps Mr Stride was referring to peak times only? Some may recall the roadworks which took place a few years ago (whilst Thames Water repaired the Victorian mains), and how Deptford Church Street became gridlocked and Creekside became a continual rat run for a couple of weeks or so. As it is, there only needs to be one accident on either of the main artery roads – the A2 or A202 – or closure of Blackwall or Rotherhithe tunnels, for Deptford Church Street to become gridlocked. Or for an accident on Church Street to back up all the way to New Cross Gate etc. With partial closure of Deptford Church Street likely to last for up to a year during Phase 3, pollution levels from stationery traffic on all sides of Crossfields may become unacceptable. In theory it could be said that Church Street is already just a two way street because of the bus lanes, but traffic will inevitably be slowed down by the partial closure, causing traffic to divert to Creekside. Moving bus stops may not be that inconvenient but there is no mention of pedestrian crossings. Redevelopment at Faircharm will be taking place soon if not at the same time, and whatever happens there, we understand a decision has already been made not to use Deptford Creek to transport materials in and out, so Creekside will already have its fair share of lorries. On top of that, the Deptford Church Street lorry route will use Norman Road, where Thames Tunnel work will also be taking place at Greenwich Pumping Station. That will go on for five years and will also use Norman Road and Greenwich High Road to transport materials. So we'll be surrounded on all sides. See the Greenwich Pumping Station document here. Please watch out for further updates and details of how to oppose these plans. If you would like to go on the Don't Dump on Deptford's Heart campaign mailing list, please email them here. With Dame Joan Ruddock in the Chair, Oliver Seal spoke on behalf of Deptford Heart's campaign, followed by Phil Stride from Thames Tunnel. Ms Ruddock then opened the meeting up to questions from the floor. 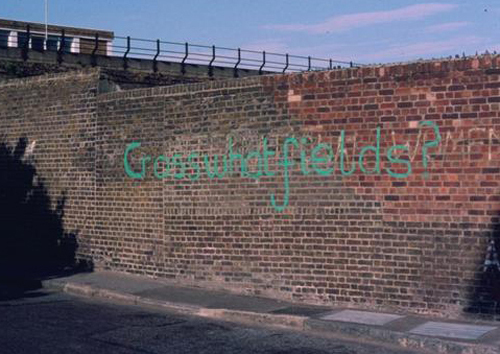 The campaigners wanted to understand the reasons why the Crossfields Open Space site had now been chosen in preference to what had originally been Thames Tunnel's preferred site at Borthwick Wharf Foreshore (next to Millennium Quay). Stride was asked how many properties would be affected at both the Borthwick site and at Crossfields Open Space – exactly how many residents would be affected at each site? Stride didn't have the figures to hand. Joan Ruddock stated that her assistant would be noting any questions raised that Stride could not answer at the meeting so that they could be put to him in writing afterwards. Stride said the residents at Borthwick Wharf lived much closer to that site, but a member of the audience pointed out that the population density is far greater in the area surrounding the Crossfields site, even if residents/businesses were a little further away (although the school is very close). Another pointed out that construction work would take place during the day, overlapping with school hours at St Joseph's, whilst many Borthwick Wharf residents would be out at work and therefore not exposed to noise and dust. Someone asked why it was so difficult to get hold of any of the raw data Thames Tunnel had used to make their decision, so that the public could draw their own comparisons – persistent enquiries over the past few months had not been answered. Stride said he was surprised. One person stated they had not even been able to obtain a map of the consultation area, whilst another questioned the criteria used: he had been told that a school counts as a "single receptor", equal to a single flat. Why did they have to close half of Deptford Church Street? (One side of the dual carriageway would be closed for up to a year). Stride said this was because the main sewage tunnel already runs under the road (on the west side) where they would need to intercept it. He said they had used Transport For London modelling which showed 640 vehicles per hour used the north of Deptford Church Street. Thames Tunnel would only be adding four lorries per hour to this statistic. Someone from the audience immediately pointed out that one side of the dual carriageway would be closed, so these statistics were irrelevant. Two members of the audience highlighted the problem of both the high street and Creekside being used as rat runs as a result of congestion on Deptford Church Street. Both are also conservation areas, highly populated, and pollution levels are bound to increase with stationery traffic. Crossfields would be surrounded on all sides by polluting gridlocked traffic. But it appears the only strategy was to offer double glazing to the school (which wouldn't help the children when they were in the playground). Needless to say, partial closure of Deptford Church Street will result in hold-ups that will spread out along the A2 and A202, affecting yet more people. Why are Thames Tideway Tunnel reluctant to use the river instead of roads? Apparently this was because they had to bring in ready mixed concrete as well as remove earth. This didn't convince the audience, one of whom pointed out that construction at Paynes & Borthwick mixed on site (and where there was very little road disruption). Another pointed out that you can mix concrete on barges, and another that there was a concrete mixer at Deptford Bridge (Prior's Aggregates), and waste could be removed by barge. Stride said there were prohibitive costs involved at the Borthwick site since they would need to build an island out on the river before they could begin to drill a hole there. Someone pointed out that wealthy Barnes had fought off proposals and an alternative site was found in a poor part of Battersea – wealthy areas tend to have a stronger voice, with easy access to expertise, lawyers and media. Stride dismissed this analogy and insisted that cost was not a driving factor, but Value For Money was. Someone asked for figures. What were the comparable costs of the two different sites? Come on, give us a ballpark figure! None was forthcoming. What's the size of the pot, someone asked. Stride said they'd be unable to offer non-statutory compensation (should people be unable to sell their homes), but there could be statutory compensation paid for such things as secondary glazing and loss of business, although it would appear they do not expect too many such claims at the Crossfields site. Stride said they had learned from Crossrail not to award contracts to firms who then subcontracted out, thus the main contractors would be more accountable. Cllr Madeleine Long asked if Stride intended to go the Secretary of State and the government's Infrastructure Committee (the next stage of the process) with only one proposal. Since this part of the process could go on for a couple of years, might they find themselves back at square one if this site was eventually turned down? Might their business plan be a little faulty? The meeting closed late at around 9.30pm. Also read Joan Ruddock's speech in our previous post. It's Open House time again – a chance to have a nosey round both new and old buildings and spaces all over London. There's a small exhibition at Deptford Lounge where you can pick up a free brochure which lists all the places to visit this weekend. 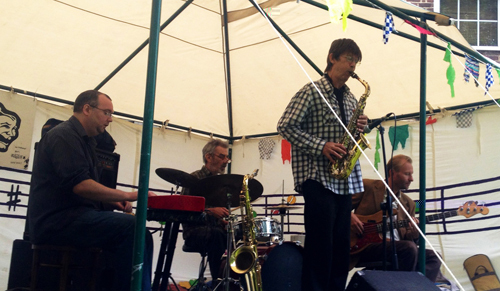 Otherwise check online for venues: in Deptford there are five places to visit – Lewisham Arthouse, Margaret McMillan Park, Seager Distillery Tower, Tidemill Academy & Deptford Lounge, and The Laban. 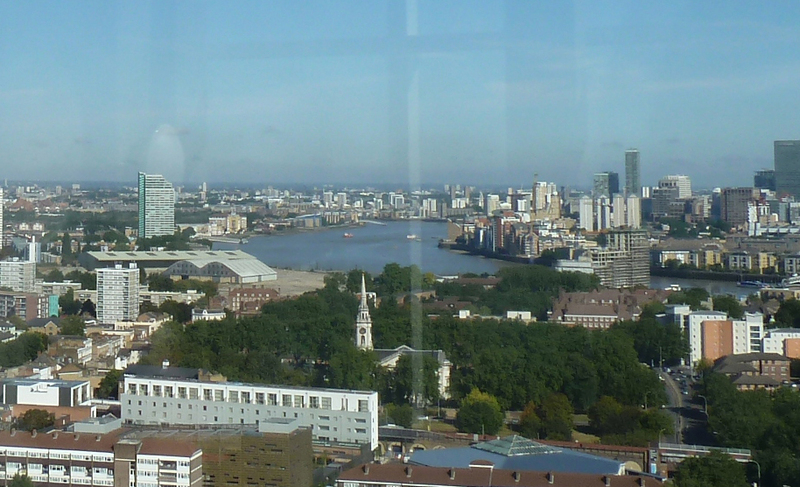 One of these somewhat familiar spaces promises a view of Deptford not usually on offer. Meanwhile, if you don't get any further than the Deptford Lounge, the exhibit there foretells Lewisham's plans for the high street – hoist the anchor and brace the mainsail, me hearties. We don't do telly reviews, nor do we usually cover anything much in Lewisham, but tonight's first episode of BBC2's The Choir: Sing While You Work featured staff from Lewisham hospital and associated Lewisham NHS services, and is worth a mention. If you didn't see it, watch again on Tuesday 25th and get ready with your hankies. The touching thing about this episode is that the people who care for us find it difficult to sing a particularly emotive song, REM's Everybody Hurts – although they're fine with Bill Wither's more hopeful and positive Lean On Me. In a place where everyone visiting literally does hurt, the staff are trained to maintain a professional distance, for the sake of all-round sanity, a strategy that often makes one's visit or stay in hospital sometimes feel less than satisfactory – but imagine if the staff all felt your pain like you do. It's particularly poignant when you think about how NHS staff must actually be feeling themselves what with the insecurity and damage being wrought on them by this government. The next episode features a Post Office choir in Bristol – more threatened work staff then, who need cheering up with the healing power of song. Protect our NHS! Sign the petition to local doctors. It seems Deptford High Street has inspired the Channel 4 Dispatches team with more than one idea for their investigations, the last one being Britain's High Street Gamble aired on 6 August (see post). "As other High Street retailers struggle, Poundland is booming. With a new store opening on average every five days, its pre-tax profits are up 50% in a year. In this Dispatches investigation, Harry Wallop asks how Poundland sells so cheaply, yet makes so much money." The Dispatches team set up their own Poundland shop on Deptford High Street "to show that size matters when it comes to bargains." See the clip here. 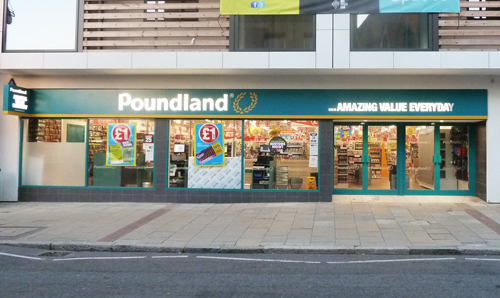 See also the Deptford Dame's post on Poundland's arrival in our street. Utrophia is hosting a rooftop cinema screening of eco-themed sci-fi classic Silent Running (1972) tonight at 7.30pm, presented by pop-up cinema The Vanishing Point in association with Scala Beyond. Tickets are pricey at £13 (£14.50 if you book online), but the evening will include quite a few interactive extras such as sci-fi themed installations, food, bar, ecological garden, live music, and if you come dressed as a robot you can get in for a tenner. Meanwhile, if you like open air cinema, you can see FREE films outdoors at The Scoop at Tower Bridge. 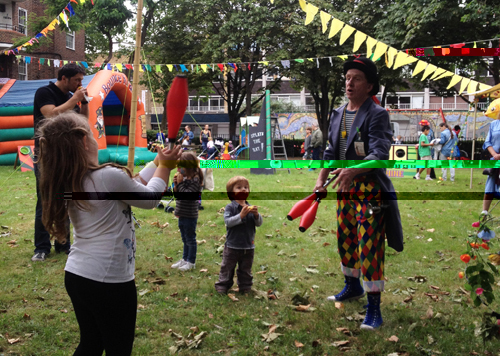 Part of More London Free Festival, they're showing free films on Wednesdays – Fridays at 7.30pm till 28th September in their 800-seat outdoor sunken ampitheatre next to City Hall. Check out the films on offer here. The inside of the old Halifax is being fitted out. Staff in Greggs next door and street traders say it's going to be Cash Converters. But grocer Ralph says, "Get it right, it's Cash Generator." Not much difference, really. They both sell second hand goods that have been bought from the public for less than half their real value, (although they regard themselves as the high street equivalent of eBay). They both offer payday loans, cash advances, short term personal loans and pawnbroking services. 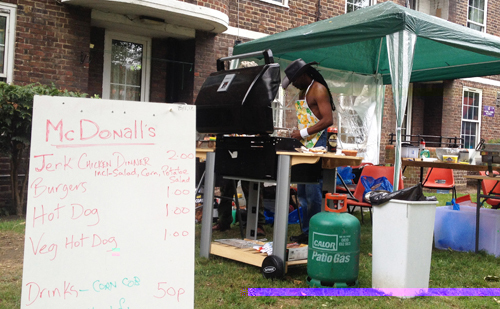 They offer a quick way to raise cash and, as Ralph says, "It's better than a bookies, innit." So, what'll the shark tally be in the south end of high street now? Betting shops 5, Pawnbrokers 5. But Cash Generator does not consider itself a pawnbroker – 'pawnbroking' presently accounts for only one per cent of its business (though it might be said that most pawnbrokers' business is now PayDay Loans anyway). They claim their core retail activity is buying and selling second hand mostly electrical and entertainment goods such as TVs, laptops, mobiles and cameras. Their 2009 gross profit was £30m and they plan to open 50 new stores a year (with a potential 500 locations earmarked across the UK) to compete with their obvious competitors, Cash Converters. They are owned by US company Axcess Financial, whilst another US company EZCorp owns Abermarle & Bond and Cash Converters. 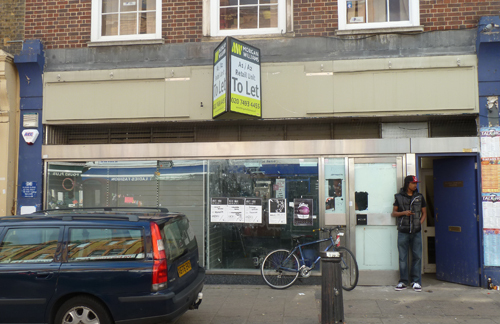 Betfred's move to take over these premises was thwarted by the Government Planning Inspector, who saw fit to alter the planning class of this particular unit (A2 Financial Use) to exclude betting shops. However, pawnbrokers fall within two planning classes – Retail and Financial, so can pretty much open anywhere. We can't find any planning applications for signage for this address, but expect something gaudy which, (like Abermarle & Bond, Paddy Power, Poundland et al) they probably won't even bother to get permission for. What's going on in that patch of ground opposite Farrer and Congers House, next to the church? 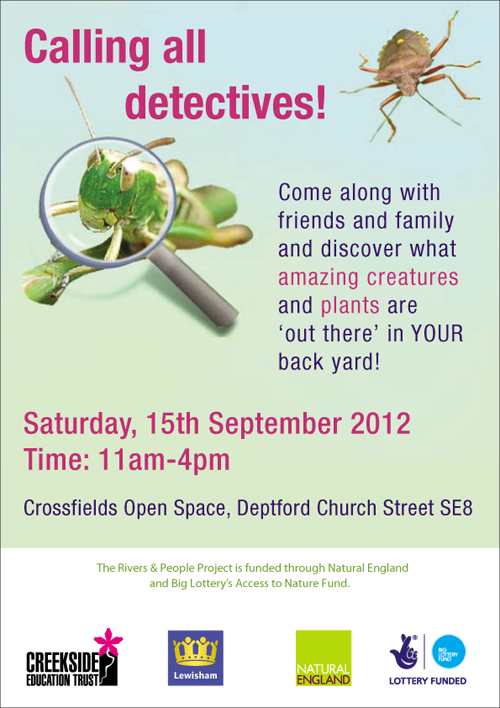 Crossfields Open Space, where they want to drill a big hole to make a tunnel to connect to the proposed Thames Tunnel? May there be beasties there, minding their own business? Every Crossfields resident should have received the Parking Survey letter and questionnaire sent out in August. This has been sent out a second time because the first time it didn't seem to reach some households, particularly those in Frankham House who happen to be the most bothered by the issue of parking. Some also didn't receive a Freepost envelope and there was no address to return the questionnaire to. It was consequently discussed at a TRA meeting with some heated opposition. Some people also felt the questionnaire was asking for personal information (car ownership details) that was unneccessary in a process that claimed to be a consultation to find out whether we actually need or want a parking enforcement scheme. Now that the survey has gone out again, we have enquired about the neccessity of providing details of car ownership, and were told it is not essential to fill in this information when returning the form. So if you have any feelings either way about Parking Permits for the estate, please do make sure you return the questionnaire to the FREEPOST address provided by Monday 17th September, and leave that section on car registration blank if you wish. Also see the comments section of this May blogpost where the pros and cons of a parking enforcement scheme (as enforced by Lewisham's private contractors ACE Security) are highlighted. Don't Dump on Deptford's Heart has organised this meeting which is open to all and will be attended by Thames Water's Phil Stride and chaired by Joan Ruddock. 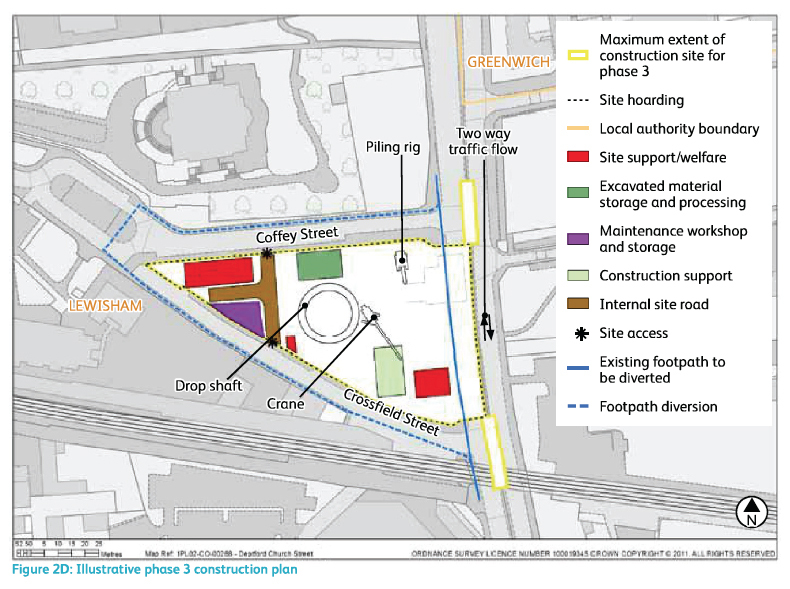 Deptford's Heart want to challenge Thames Water to explain why they are continuing with their plan to use the Crossfield green on Deptford Church Street as their preferred site for tunnel works, ignoring their own criteria for site suitability. 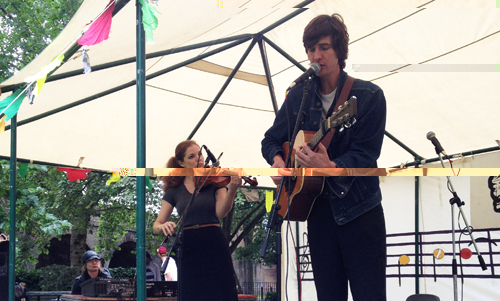 Apologies for the late notice on this blog. Please try to come along and support the campaign. Let me say at the outset that my constituents and I support the construction of the Thames tunnel. There is no doubt that we cannot continue to discharge raw sewage into the Thames. Much as I would like to debate many of the wider issues, I am essentially here to make a statement on behalf of my constituents, because Thames Water has a proposal to intercept the Deptford storm relief sewer that runs through Deptford discharging north into the Thames. The site selected by Thames Water is a triangle of green, open space—the Crossfield amenity green, which is bounded by Coffey street, Crossfield street and Deptford Church street. For those who do not know it, Deptford Church street is a major dual carriageway intersecting the Crossfield residential housing estate. 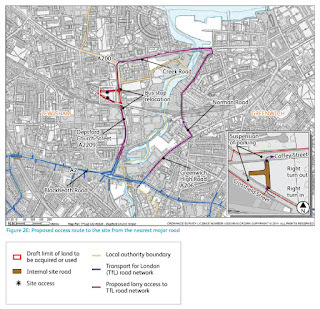 Thames Water proposes at least four years’ work on the site, the permanent legacy of which will be four main ventilation columns at least 6 metres high, with associated control units and maintenance requirements. 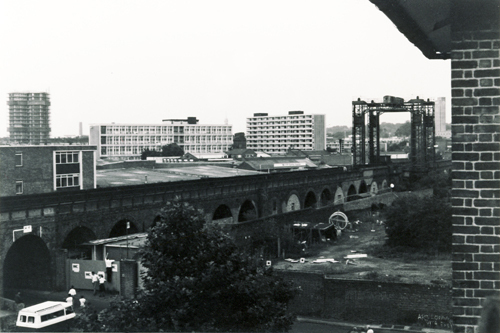 During the phase one consultation, the preferred site was Borthwick wharf foreshore, but for the phase two consultation Deptford Church street is the preferred site and the Borthwick wharf foreshore is put forward, together with the Sue Godfrey nature reserve in Bronze street, as an alternative. We in Deptford cannot understand Thames Water’s change of plans, which will have a great impact on an exceptional area of my constituency. The phase two consultation site information paper identifies three reasons why Deptford Church street is now preferred. The reasons given are, first, that Deptford Church street has relatively good access compared to Borthwick wharf foreshore; secondly, that using Deptford Church street would avoid work to the Thames foreshore; and, thirdly that the potential effects on residents, visitors and business amenity would be less than with the alternative site. assessments favour sites in close proximity to the river, with jetty or wharf facilities. Clearly, the Borthwick wharf foreshore would have a great advantage over Deptford High street, in that material and spoil could be delivered and removed using the River Thames. Furthermore, the alternative site is located at the point at which the combined sewer overflows are discharged into the River Thames. Intercepting the sewer at that point would capture the contents of the entire length of the sewer. Intercepting it further inland, at Deptford Church street, would leave a length of the sewer uncaptured. Thames Water has provided no data on the number of people, households and businesses affected at both sites, so it is impossible to compare the sites. In addition, the impact on St Joseph’s Catholic primary school on Deptford Church street is direct and severe when compared to any comparable community impact resulting from the use of the Borthwick wharf foreshore. A number of businesses will be directly affected by the use of Deptford Church street, while Borthwick wharf and the adjacent Payne’s wharf are both vacant. Let me turn to the issues specific to the Deptford site chosen by Thames Water. There are two primary schools close to the proposed site: St Joseph’s Catholic primary school is opposite the site, and the new Tidemill academy is close by. As I say, the proposed works will take at least four and a half years, which represents most of the period of primary school attendance. That area of Deptford appears in the top 10% of areas in the country in the index of deprivation, making primary education of paramount importance. Both indoor and outdoor learning will be impacted by noise and air pollution. Fire evacuation for St Joseph’s during the period is of concern. The school requires an off-site space near the school for 260-plus children and 25-plus staff, and they need to reach it quickly and safely. The site currently used is the green space that Thames Water proposes using for its shaft and associated construction works. No impact assessment on the school and its fire regulations has been offered. Sited alongside the green is the grade-I listed St Paul’s church, the single most significant listed building in Lewisham. The proposed shaft and associated building works directly affect the setting and structure of the church, the boundary wall to the church cemetery, which is listed in its own right, and the grade-II listed railway viaduct to the south. It is therefore not surprising that English Heritage has expressed a preference for the alternative site to the Deptford Church street site, as there would then be less impact on heritage assets in our area. and buses in a two-way traffic scheme, particularly as Deptford Church street is on the borough’s oversized vehicle route. 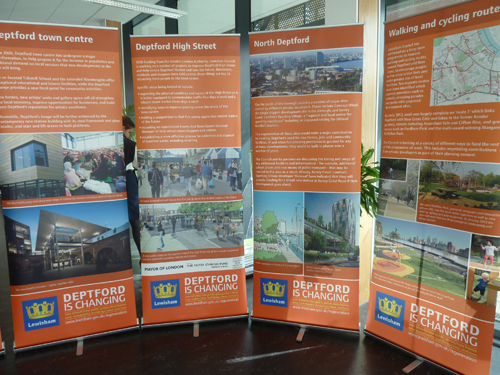 ...Overlying all the concerns that I have outlined is an aspect of Deptford that has been completely neglected. Planning consents have already been given for the construction of thousands of new homes in the immediate vicinity of the Deptford Church street site. Work is already under way and the nearby Convoys site, which has a footfall—this is quite amazing—equivalent to the whole of the south bank, is expected to be redeveloped over precisely the same period as the Thames tunnel. This is a prescription for chaos. It is particularly unfortunate because Deptford has enjoyed a prolonged period of regeneration led by Lewisham council, financially underpinned by the Labour Government and supported by a number of private sector partnerships. Lewisham is the 12th most densely populated local authority in the UK, and my constituency the most dense of all. 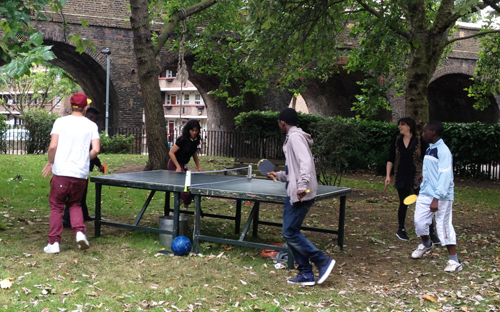 As a consequence, every small piece of open space is greatly valued and provides essential green lungs for the city. The Crossfield amenity green will be made unavailable and inaccessible for at least four years in an area of very limited open space. 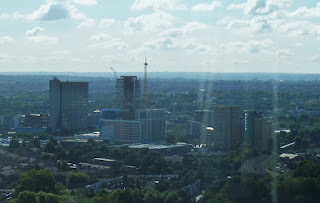 Lewisham borough’s core strategy emphasises the importance of improving connectivity throughout the area for pedestrians and cyclists. The recently completed links project from Deptford high street through to Margaret McMillan park, as well as the work on Giffin square, the Deptford Lounge, Tidemill academy and Wavelengths, demonstrate the implementation of the council’s strategic aspirations for the area. 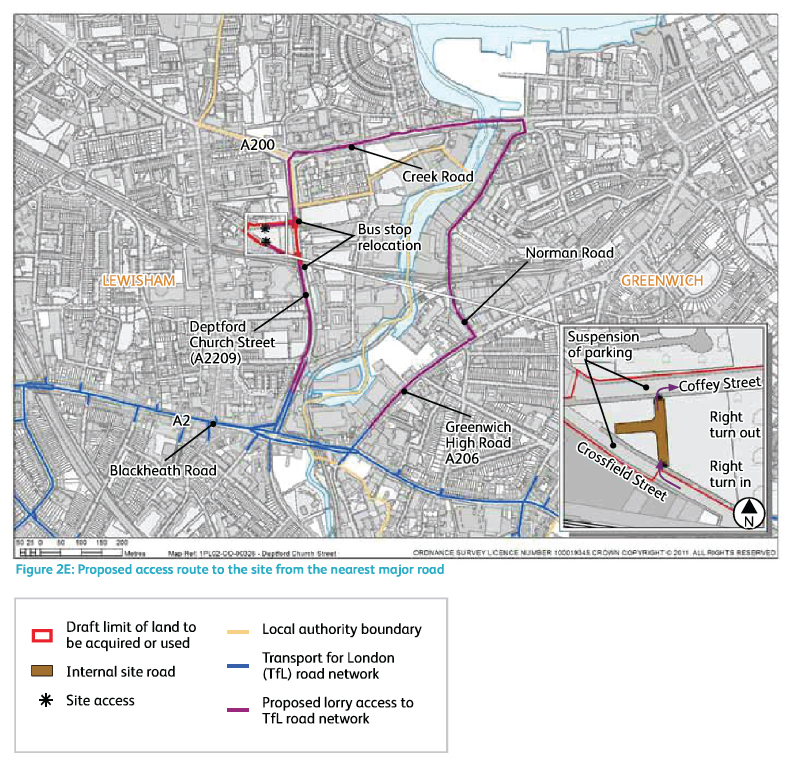 The completion of the Thames tunnel site works is not expected until 2021, resulting in an unacceptable delay to the delivery of the council’s strategic objectives for links to and connections through the area. Furthermore, Deptford high street is classified as a site of nature conservation importance in the adopted unitary development plan. If the borough were the local planning authority for this application, it would either refuse permission that had adverse impacts on nature conservation or, if development were considered essential, it would require an environmental appraisal that included methods of mitigation and proposals for compensation.